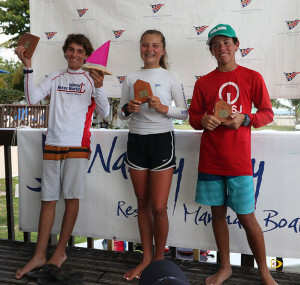 Rayne Duff capitalized on Mia Nicolosi’s miscues, in her quest to become the first BVI Dinghy Championships 3-peat champion, opening the door for him to win the event that wrapped up in the Sir Francis Drakes Channel just off Nanny Cay on Sunday. Last year, Nicolosi and Duff finished either first or second in every race, with Nicolosi edging Duff by a point to become a repeat champion. This year however, everything was quite different. Nicolosi of the St. Thomas Yacht Club, stumbled out the gate and finished 10th in the opening race, while Duff placed second. In her next race, Nicolosi had an over early and finished at the back of the pack, while Duff was again second. Nicolosi returned with three straight bullets and two second places while Duff, whose worst finish was third, beat her in the last race of the first day, for an 11-17 advantage. Duff went on to wrap up the regatta with three victories on Sunday and finished with 17 points to Nicolosi’s 31. Duff said he was relieved when Nicolosi messed up on the first two races. Both will be competing in next month’s St. Thomas Optimist International and Nicolosi will go on to compete in the Optimist World Championships in Thailand. Meanwhile, St. Thomas’ Sibilly won the VIODA Triple Crown, which included the Crucian Open on St. Croix and the VIODA Championships on St. Thomas, after winning the Blue Fleet in the BVI Dinghy Championships. Jose Arturo Diaz of Puerto Rico was second and Katha Majette, also from St. Thomas, finished third. Final BVI Dinghy Championships results. Red Fleet: Rayne Duff, BVI, 17 points. 2. Mia Nicolosi, St. Thomas, 31. 3. Caroline Sibilly, St. Thomas, 44. 4. Jose Arturo Diaz, Puerto Rico, 51. 5. Tiare Estela Sierra, Puerto Rico, 56. Opti Green: 1. Sebastian Medina, Puerto Rico, 21. 2. Gian Marco Piovanetti, Puerto Rico. 31. 3. Ben Thill, St. Thomas, 53. 4. Amanda Plaxton, BVI, 56. 5. Alexandra Tonin, St. Croix, 57. Laser Radial: 1. Daniel Smit, Antigua, 14. 2. Mateo Di Blasi, St. Thomas, 15. 3. Stephon Ganga, BVI, 32. 4. Alex Rambarose, BVI, 42. Jerome Parkins, BVI, 48. IC-24: 1. Richard Wooldridge, 10. 2. Colin Rathbun, 11. 3. Graeme MacCallum, 12. 4. Martin van Houten, 25. 5.Ted Reshetiloff, 26.